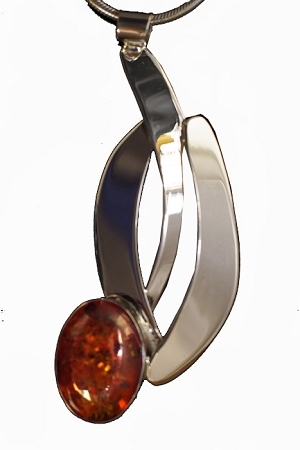 Modern Curves Jewelry - This handmade bold sterling silver pendant is accented by a beautiful oval orange brown Baltic Amber cabochon (18mm x 13mm). This One-of-a-Kind artistic necklace comes with an 18" sterling silver snake chain. 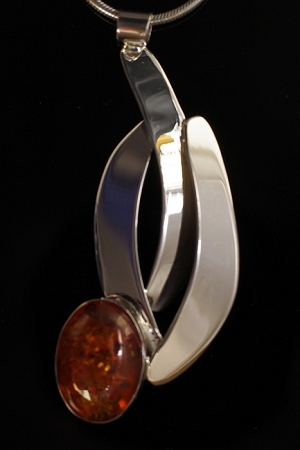 From our "Modern Curves Collection", a beautiful sterling silver pendant (2.5" long x 1" wide") accented by an oval Baltic Amber cabochon (18mm x 13mm). The silver design is classic with a touch of modern and compliments the stone. This pendant dresses up any outfit and includes an 18" sterling silver snake chain. Matching earrings and rings are available. This necklace is an artistic work of art and is signed and created by Aaron Rubinstein and Modern Art Jewelry.